The Etsymetal Blog Carnival, is in town again. This month the theme we're all blogging is our favourites from the Ring a Day project on Flickr, There's some amazing and inspirational work being made. Just how am I supposed to pick one favourite? Well, I'm going to cheat and share a couple of rings which are playful, interesting and made me smile. 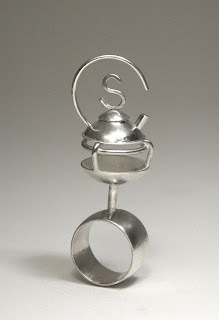 MikeandMary have produced some works of wonderful whimsy, but I love this tea kettle. It's so poised. 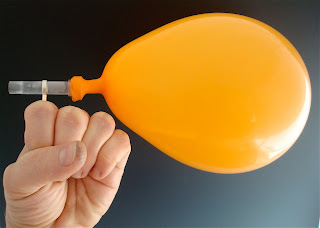 Danielle Miller's balloon blower. This is a fun idea and a great image. I want one of these! 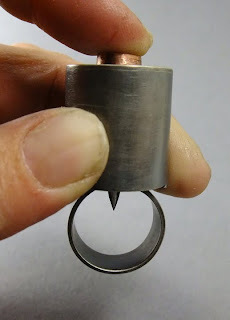 This ring from Metalriot shows a decidedly warped sense of humour- isn't it intriguing? This is just a glimpse of the amazing variey of styles on show. I feel I've hardly scratched the surface, there are so many I want to show you.....Norsolas rice box ring, Chris Parry's book ring, Experimetal's beaded crotch............. I hope you can take a minute to look at the links below to see other Etsymetal jewellers and their favourites from Ring a Day. wouw, I admire everyone who can keep up with make one ring everyday day!! Su, thanks for featuring my balloon ring. This project has been such a burst of creative energy!